What’s that, you haven’t even heard of Flappy Bird? 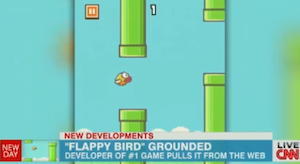 Though it was first released last May, CNN notes that the game suddenly picked up steam in December and had reached bona fide viral success by January. In it, players steer a little bird through a maze of metal pipes ( which themselves are reminiscent of Super Mario Bros). And it’s now been downloaded over 50 million times. Sometimes simplicity is the key to success, eh? But while those who have already downloaded it can keep playing, no new users will be able to get in on the action. He’s not saying much else about the reasons for his decision to pull the game, which he created in a few days last year and didn’t promote at all after its release. There’s still hope for those who want to play — if you’ve got deep pockets, that is: Time.com reports that phones with Flappy Bird already downloaded on it have already popped up on eBay for as much as $1,499. Ah, priorities.